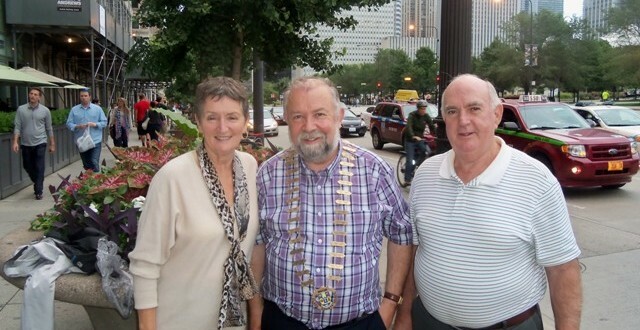 Cathaoirleach of Clare County Council, Cllr John Crowe met with former Shannon Airport employees Margaret and Frank Furey during a visit to Chicago, Illinois, USA. An all-island tourism delegation with connections to the only undisputed High King of Ireland, Brian Ború has undertaken a promotional drive at the world’s largest annual festival of Irish culture. Coinciding with the millennial anniversary of Ború’s death at the Battle of Clontarf in 1014 National Brian Ború Programme representatives, including adelegation from County Clare, are attending the annual Milwaukee Irish Fest in Wisconsin, USA. The delegation is attempting to lure some of the estimated 150,000 festival goers to County Clare during 2015. 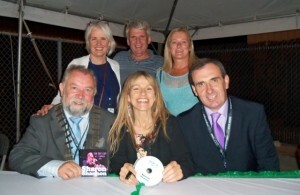 Clare artists Sharon Shannon and Socks in the Frying Pan are also performing at the Fest. Ahead of the Milwaukee visit, the Cathaoirleach of Clare County Council Councillor John Crowe met with the Governor of Illinois Pat Quinn and members of the Clare community in Chicago.